frenetic, happy life in Durbs South Africa, making teepees and having fun, along with our favourite Totem Team – Nomsa, Chipo, Simon and occasionally Barbara. We didn’t really have a plan when we started making teepees, and just let it evolve as the demand increased. And that’s how we got here, 10 years later, FINALLY getting ourselves a website. •We love what we do. Like we really really really love it! • 2019 marks our tenth year making teepees! Yay! • We work from our home, from our converted garage. We don’t have a big, grand showroom. Chipo and Nomsa work 5 days a week, and Simon is here part time. You’ll find Roy at Shongweni Farmers’ Market every Saturday and Wonder Market on the last Sunday of every month, and Tam is almost always at I Heart Market on the first Saturday of every month. • Our sons are our muses. They’re also simultaneously our sweet darlings and sweaty savages. But we love them. Simon is usually muttering under his breath about the hacksaw and sander which have disappeared AGAIN, no thanks to our kleptomaniac sons. • It took us this long to get a website because we’re scaredy cats – that it would be horrible, and it would be too hard to manage. We’re still scared, but it’s time. Jett, one of our cockatiels, sits on Nomsa’s shoulder for long periods during the day. She LOVES him! Our ladies really are part of the family! 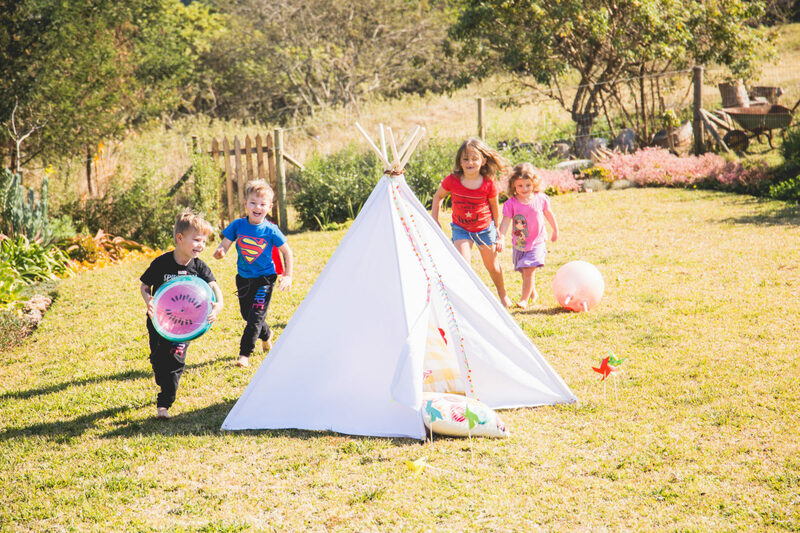 Totem Teepees are incredible toys – they inspire imaginative play and magically whisk children off to worlds they can only dream of. We believe in our teepees. We believe in the benefits of a child’s very own play space. Teepees are not just meant to look great in a perfectly Pinterest worthy playroom…they have a function – and that’s what drives us. We know how beneficial teepees are, and that’s why we make them. For you. For your children. If you haven’t got a Totem Teepee, are your children even living? Totem teepees are investments in the future. There are no batteries, there’s no plastic, and they’re completely made by hand by our little team. Your Totem Teepee will last your childrens’ entire childhood and could be handed down to their children. That’s pretty awesome! They’re what we call open ended toys and if we haven’t convinced you to get one by now what will? Anyway, I wasn’t supposed to ramble, yet here I am… so – check out our website. What a lady. She’s constant, hard working, loves my sons as her own, and her extra special talent is being able to find ANYTHING. And trust me when you work from home which can be a cramped space, that’s a BIG skill!!!! Nomsa is in charge of fabrics: Sorting, packing, rolling and washing. And she picks up the slack when Chipo is not keeping up, in addition she irons every single teepee. Also, our lovely Nomsa makes her now famous #NomsPoms – these are pom pom teepee toppers which she makes for us to sell at our local markets. We provide the yarn for these, and Nomsa gets 100% of the money from the sale of these gorgeous homemade decorations. At Totem Teepee, upskilling and empowering our staff where we can, is just as important as putting a meal on our own table. Nomsa has taught herself how to make the NomsPoms, and her 4 grandchildren whom she is the sole provider for, all craft and crochet these poms together. We think she rocks! Our dear Chipo is a Zimbabwean mom of 2 primary school aged children. She started on a flexible basis and very soon was working full time, and we’ve not looked back. Happy, willing and an eager learner, Chipo is part of our family. We met her when her daughter and our son were in preschool together. We also attend the same church as her. Since we work from home, it’s important for us to have staff members who are welcome in our space, and feel at home, and ours do! Our children arrive home from school and run to say hello to Chipo every day, she is well loved and a valuable member of our team. He also helps the ladies with fabric, when there are 100m rolls of fabric to be moved, rerolled and cut – he’s our muscles and we love him. No job is too big or too small for Simon. Occasionally the work load just gets too much to handle, and that’s when this lady steps in – Barbara, also from Zimbabwe, is always on hand to join our team, on a seasonal basis, when we can’t keep up with the workload. Her skills are exceptional. She has graciously taught Chipo on the job, and has even set aside her work at times to whip up last minute school dress up costumes for our sons when the need arrives. Our sons are also very good at sneakily getting her to fix their favourite items, and make fingerless gloves, spiderman masks, ninja turtle shells among other things.